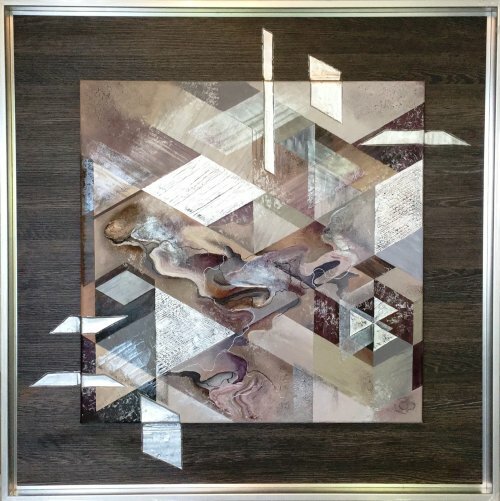 Original painting on canvas, which is backed with a wooden board and framed in a silver deep frame creating a well presented artwork. It has a variety of paints with opaque and glossy finishes, with metallic silver accents making the look very modern. The muted colour will fit in nicely in any interior scheme. Unusual geometric shapes look almost 3D and achieve a complex composition offset by organic shapes with a lot of movement. The viewer will want to explore this painting for a long time and come back to it time and time again.